A few weeks ago, the good people at Food 52 asked for testers for their raspberry recipes. Every time they do so, it becomes a first-come, first-served frenzy as community members call dibs on the various recipes. This time I snagged the Spicy Raspberry Mint Soda. The directions were easy. Make a simple syrup with raspberries, cinnamon and dried pepper and you've got yourself a spicy pink concoction. Add some mint, ice and club soda, and you've got a summer drink. It'll make you and the kids forget all about lemonade. I even said so in the testing notes. Add some gin, and you have an adult summer drink. The inventor behind the drink, Gr8ChefMB suggested vodka for an adult version. The vodka version was okay. The gin was significantly better. As it always is. Have I mentioned I'm partial to gin? If you're at all sensitive to spice, make sure to take out all the seeds. Contrary to some sadists' beliefs, there might be such a thing as too much heat. 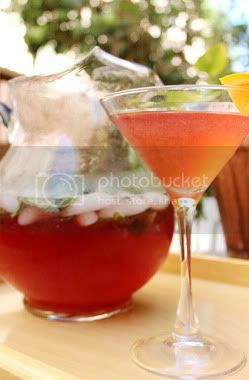 To relieve yourself of behind-the-bar time and allow yourself more party time, make a full pitcher. Follow the directions to make the simple syrup. Then muddle a good handful of mint (a semi-packed cup), and throw it in a pitcher. Fill halfway with ice, then add the strained, cooled syrup, followed by a liter of club soda. To keep this child-friendly, leave as is. 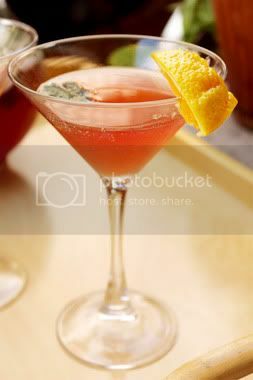 If you're too mature for virgin drinks, splash an ounce of gin in a martini glass and fill with the mix. Garnish with oranges. They taste good with a squeeze of oj, too. Perfect for summer, great post.